St. Isidore’s Catholic parish was founded in 1910 in Danville. But that date certainly doesn’t mark the first Catholic service here. The next known mass took place here in 1875 at the home of Edward and Mary McCauley. The mass was celebrated in Green Valley on the occasion of a sick call by the Dominican Rev. James H. Aerden. At this time Father Aerden set up a regular celebration of mass at the Alamo Hotel Hall on the fifth Sunday of each month. Eight years later, in 1883, Rev. Lawrence Serda took charge of Walnut Creek, Lafayette and Moraga Valley and celebrated mass for a congregation composed of ten families in the Walnut Creek Grange Hall on the second and fourth Sundays of the month. 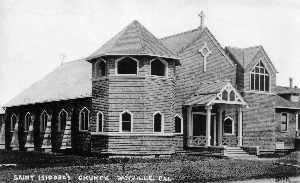 In 1884, on land donated by Mr. and Mrs. Antone Silva Botelho, a church was constructed in Walnut Creek and dedicated in two services, one in Portuguese and one in English. According to the Walnut Creek Courier Journal in 1937, “On April 20, 1910, Archbishop Patrick W. Riordan established Danville as a parish center, appointing the Rev. John Collins as the first pastor. St. Mary’s Mission of Walnut Creek was then detached from Martinez and transferred to the parish of Danville. The church and rectory cost $11,000. Located at the corner of Hartz Avenue and Linda Mesa, the church was dedicated by Archbishop Riordan on July 28, 1912. Father Peter C. Yorke preached the dedication sermon. St. Isidore’s Golden Jubilee program states: “The firm of Shea and Loquist was selected as the architects, while the contract for the buildings was given to Stanley and Archer.” “The new parish of St. Isidore embraced expansive boundaries, taking in the Tassajara School District, bordering Livermore and Pleasanton, touching the Hayward and Oakland parishes on the west, including Moraga Valley and Orinda, and the boundaries of the Martinez and Concord parishes to the north, and along to the eastern slopes of Mount Diablo.” Other parishes were formed from St. Isidore’s beginning in 1941. In 1960 the parish boundaries went to Livorna Rd, the County line on south and the Morgan Territory on the eastern slope of Mount Diablo. Chuck Fereira remembered the friendly Father Plunkett with a funny anecdote recently. In the 1950s, when he and friends attended a Catholic education class after school one day a week, the boys occasionally gave the nuns some problems. Sister sent them to Father Plunkett for another level of discipline. After saying they needed to behave, he gave them candy and sent them on their way. Perhaps a different message than Sister had in mind! As the Valley’s population swelled after World War II, the congregation outgrew the original church and a new St. Isidore’s Church was completed on La Gonda Way. In 1960 the congregation celebrated its Golden Jubilee, dedicating the program to Father Henry Plunkett who served the church from 1951 to 1958. In 1963 the old building was razed while many in the congregation watched with sorrow. Tony Cabral, who had worked on the church when he was just 22, said only the finest materials were used and “was built better than the buildings of today.” He saved some wrought iron railing and a large post from the wreckage. Lena Fereira recalled that her mother, Mary, cared for the altar and did much of the maintenance work in the church for 35 consecutive years.